Mountain biking is an excellent way to see the sights and experience speed and exhilaration at the same time. The activity can be tailored to suit groups of all abilities. 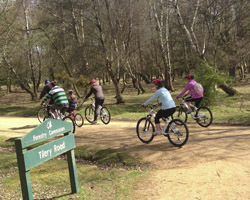 During the activity, groups can cycle through some of the UK’s best off-road routes and stop at points to look at local wildlife and for a picnic. We have excellent off road routes with qualified instructors who can take you through beginner or advanced courses. We provide bikes, helmets, puncture repair kits and a selection of route maps which cover any level and experience. All bikes are well serviced and in good working order. A deposit is required on all bikes, this is refunded when bikes are returned safely. Mountain Biking is a great group activity. The course can be suited for all abilities with additional tasks and challenges added to provide a teamworking element. Stag groups will enjoy the thrill of mountain biking. 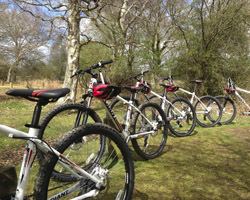 Go on guided tours with experienced instructors or just hire bikes and blaze your own trail. Mountain Biking is a great activity for a hen party. Choose to just hire bikes or take a guided tour with one of our knowledgeable local instructors. Youth Groups will love mountain biking. Mountain biking can be exhilarating while also being quite safe due to our safety equipment and experienced instructors.